how does this even deserve media attention other than to report that the insurance companies will act predictably by doing anything and everything in their power to retain their power? now, "democrats fire back"... WELL, FIRE BACK LOUDER FUCKERS. you dropped the ball. the shear momentum of healthcare reform should have been enough to obliterate this sort of nonsense, had the senate dems not bickered their balls off for months on end. good luck dodging the swift boat now you pussies. 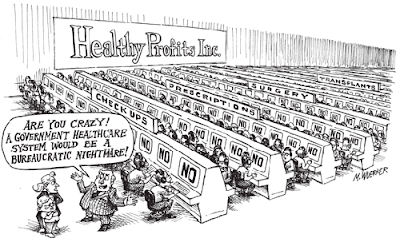 Insurance companies don't want healthcare reform any more than CEOs want to take pay cuts. That cartoon is so apt.